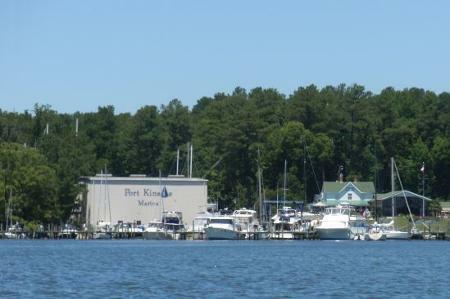 The 2010 Summer Cruise started at Zanheiser’s Marina at Solomons, Maryland. 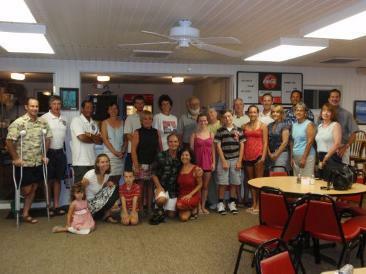 Many of us arrived a day early, which gave us a chance to transition from our busy work lives to our cruising lifestyle. 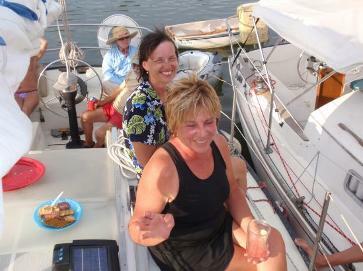 At Zanheiser’s we met Eric, Barb, Sara, and her friend Mary, who sailed from the Potomac River on their, Bristol 28, Ragtime. 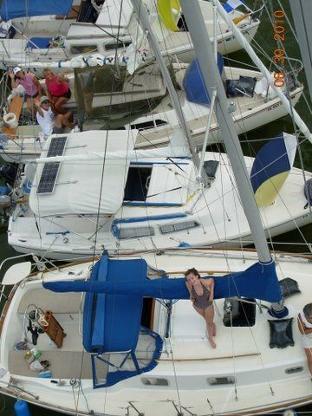 Eric, a former Fleet 10 captain, organized this year’s cruise on the lower Potomac, his home sailing grounds. 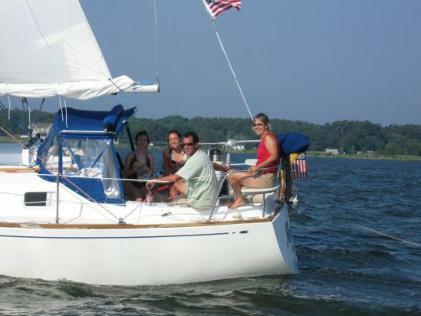 We also met Tom A. and Gina, who had been sailing on Woodwind, an Ericson 26, for weeks, and newlyweds, Matt and Karen, who put their C-22, Bellefonte Lady, together at Solomons. 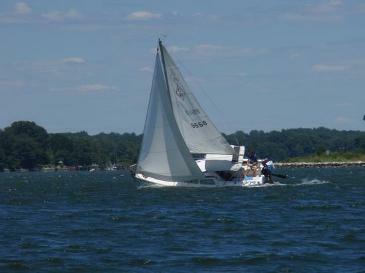 Bill also met us on Friday, sailing his C-22, Wanderer, from the Potomac. 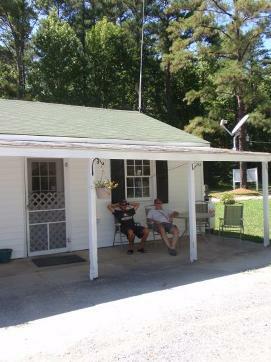 Augie and Augie IV sailed August Moon, from their home on Dividing Creek, off the Magothy River. 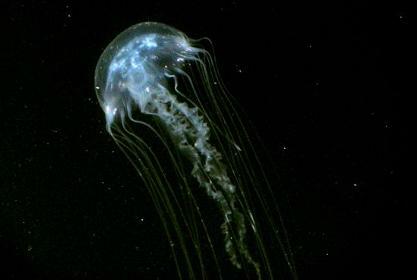 Initially it was to be a two day trip for them, but Augie IV wanted to pull his first official night watch, so they sailed into the night, enjoying a clear sky showing off the Milky Way so dense that it appeared to be a cloud. They arrived in Solomons at 0330 with a newly experienced night watch captain. 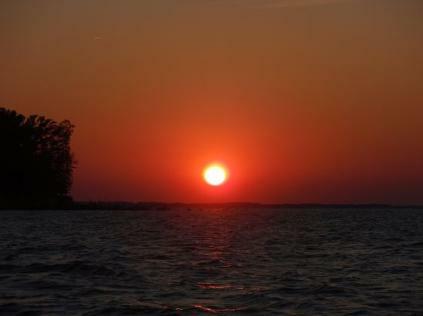 Alice and I sailed our Catalina 22, Key Largo, the 77 miles from Middle River to Zanheiser’s in two days, meeting our son, Danny, at the drawbridge at Knapp’s Narrows on the Eastern Shore of the Chesapeake Bay after our first night. 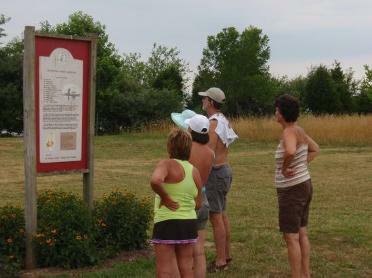 We spent the night rafted to his boat, First Draught, at Dunn Cove. 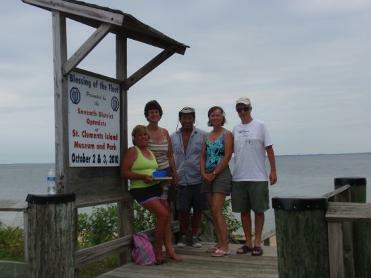 Danny had sailed from St. Jerome Point, which is north of the Potomac, to Norfolk, Virginia, then out into the Atlantic to Ocean City, Maryland, then into the Delaware Bay to Reedy Island, through the C&D Canal to Hart Miller Island, then to Annapolis. 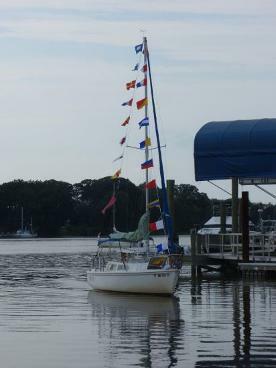 He dropped his cousin, Austin, off in Annapolis, and began single-handing his boat at that point of his circumnavigation of the DelMarVa Peninsula. He said that the weather was just right for him to accomplish this. 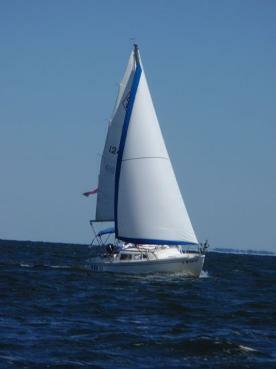 This is challenging for many boats much larger than a Catalina 22. His circumnavigation was approximately 400 nautical miles. 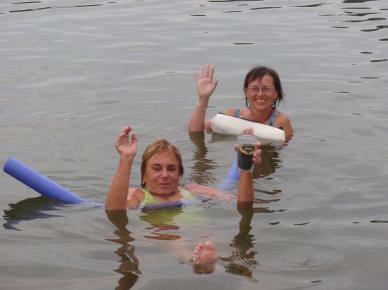 It was very hot on Saturday, June 26th, and many of us spent as much time as we could in the pool at Zanheiser’s. 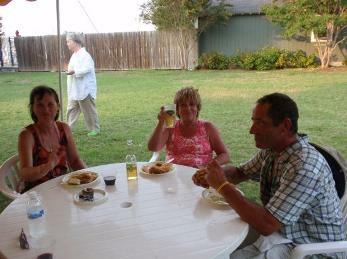 The cruise officially started with the Opening Picnic that was organized by Loretta and Tom B. 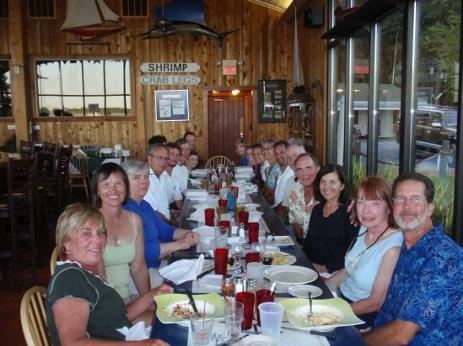 This year there were 11 boats on our cruise, six of which were Catalina 22s. 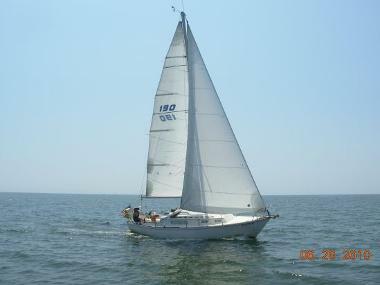 Four of the Catalina 22 sailors were new to our fleet this year. Rick sailed his C-22, Murdhuacha, from New Jersey. 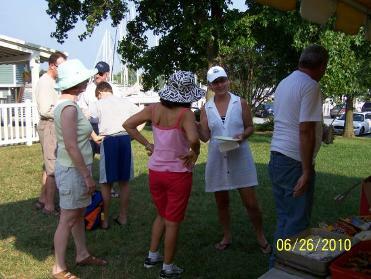 Heather and Carol sailed Yes II from the Sassafras River in the northern Bay, and Bill sailed Wanderer from the Potomac River. There were four boats that were single handed on this year’s cruise by Danny, Rick, Bill, and Richard, who sailed Shaba, a Sabre 28.
boats on the VHF radio. 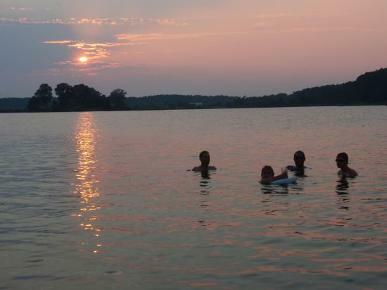 We rafted all the boats together when we got to Price’s Cove, off of the St Mary’s River, and went for a swim. The raft got very noisy during the night due to a shift in the wind. The raft broke-up rather quickly in the morning, and one of our sailors sailed in her pajamas. Loretta’s S2 9.2 (30 foot). 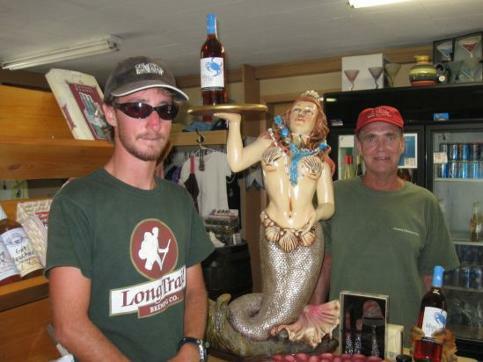 Richard received many complements on his new Fleet 10 website, which helped attract the new cruisers this year. Other new cruisers found out about the cruise by reading about it in MainBrace. Be sure to check-out the Google map that shows this year’s cruise on the website. 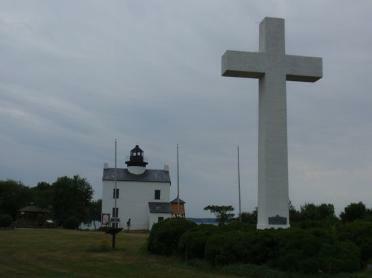 On Tuesday morning, we motored from our anchorage in Canoe Neck Creek to nearby St. Clements Island and explored the grounds around the lighthouse, the 40 foot high cross, and rang the bell. Eric and Jenifer and their children, Ian and Emily, met us for dinner. They had planned on being on the cruise, but couldn’t due to Eric’s recent soccer injury. After dinner many of us walked back to the marina, and it began to sprinkle. This was the only rain that we had on this year’s cruise. 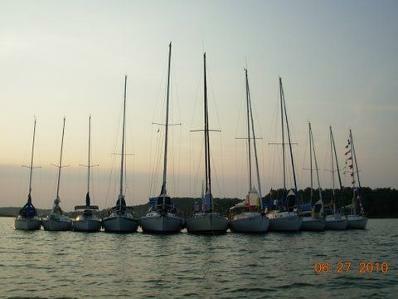 Overnight the wind came up and the temperature dropped, making it very comfortable to sleep on our boats. 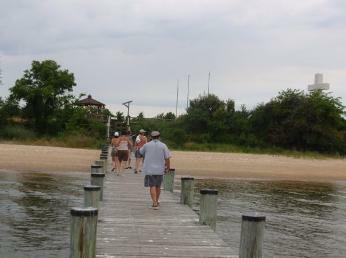 On Wednesday morning, we explored Colonial Beach, Virginia, on foot and on our little folding bicycles. There were several interesting houses, including one that had a garage for the golf carts that many people ride around the town. 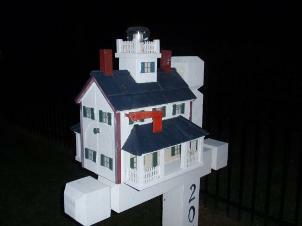 That house had a mailbox that was a model of the St. Clement’s Island lighthouse. 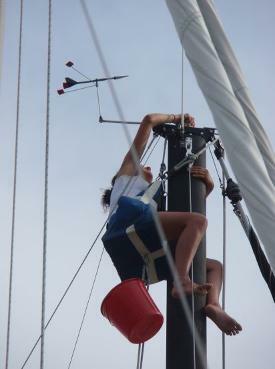 arrived saw Sarah up Energy’s mast doing maintenance. 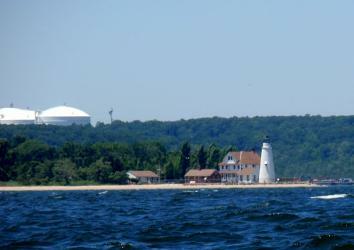 northern Bay cruise for next year. (I thought that I was the only one who thinks about the next year’s cruise while this year’s cruise is still going on). Thursday was a beautifully cool and windy day. We saw dolphins jumping and playing as we left the creek. Mooring Restaurant at the marina. The marina also ha d a camp ground. 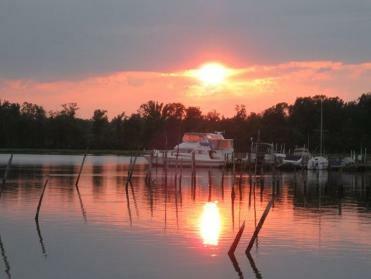 Alice and I had seen this at another marina on the Potomac when we stopped for ice. 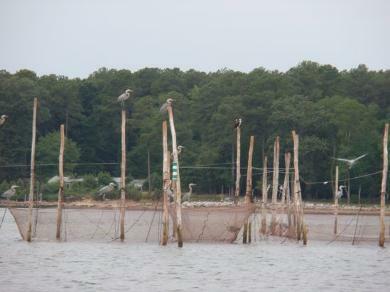 Apparently this is something that is done on the Lower Potomac River. There didn’t appear to be as many boats on the river as we were accustomed to seeing on the upper Bay, and many days during the week, if we saw a boat sailing, there was a good chance that it was another boat from our fleet. Friday July 2nd was another cool day. We sailed into a rather strong wind from Port Kinsale Marina to the town of St. Mary’s. 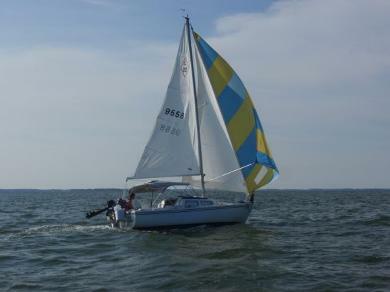 We only tacked a few times and used the north shore of the river to shelter us from the heaviest wind and waves which were 2 to 3 feet near the middle of the Potomac. We never realized how wide the lower Potomac River was. 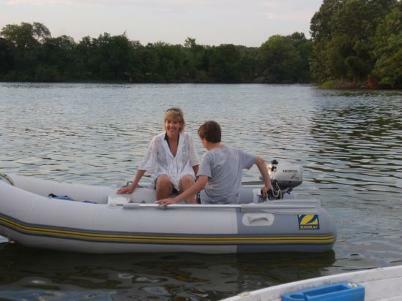 We sailed into the St. Mary’s River as far as we could without serious tacking. 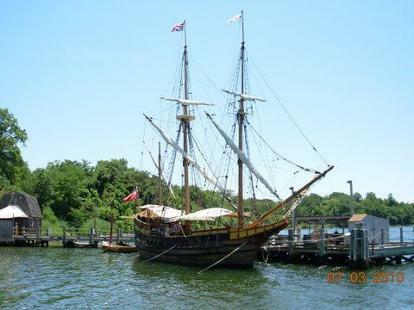 We sailed past The Dove, the replica of one of the ships that landed at St. Clement’s Island. After the river narrowed, we began to motor, because we wanted to get good seats at the concert that we were going to attend that night. Just as we approached the anchorage, our boat was boarded by the Coast Guard and inspected. This was the first time that our boat was stopped by the Coast Guard in 30 years. Everything was OK, except that our flares were long out of date. We were told that they are only good for 3 years. (We purchased new flares when we got back to Solomons. They are expensive. If we had been stopped in the bay rather than the river, we would have received a fine.) 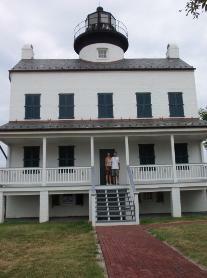 After we anchored at the Horseshoe Bend, we were dinghied ashore by our son, and then we walked across the street to St. Mary’s College for the concert. 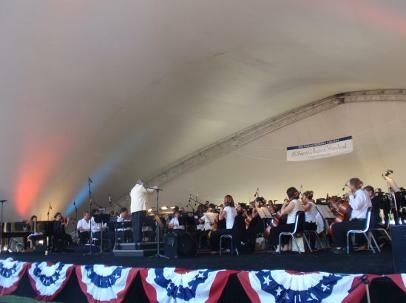 The last selection was the 1812 Overture which featured fireworks. 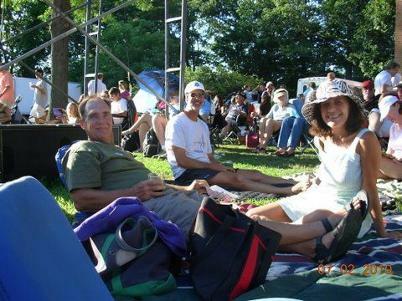 The members of our fleet all sat together on the grass, very close to the stage. I have seen the 1812 Overture preformed with fireworks on TV many times, but never seen it in person. This was an unbelievable ending to our fleet’s week cruising together. 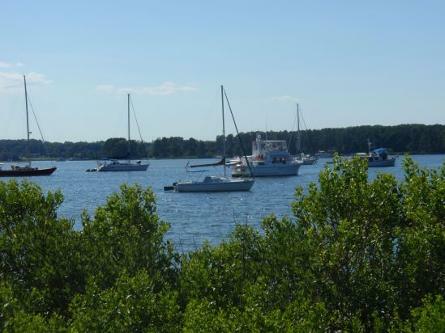 On Saturday, Alice and I sailed from St. Mary’s back to Solomons where Loretta and Tom B. had arranged a wonderful cookout for many members of the fleet that stopped there on their way home. The autopilot did a nice job for a few hours, and as the wind gradually increased, I thought that I would take over to give the autopilot a break, and to make sure that the boat was balanced and sailing as fast as possible. 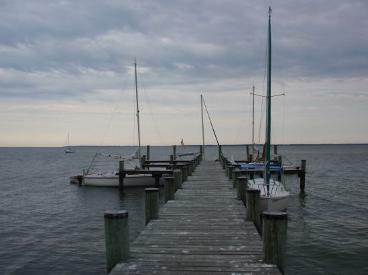 We decided to head for the West River, which is south of Annapolis on the western shore of the bay. The wind and waves continued to increase and before long we were surfing down 4 foot waves. The greatest speed that I saw on the GPS was 8.2 knots, but checking it later, I found that the greatest that it recorded was 8.9 knots. Our whisker pole broke while surfing, which made it harder to head northwest. 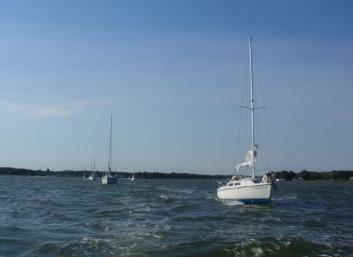 We sailed up the Eastern Bay to get out of the wind and waves, and anchored in Claiborne Creek. 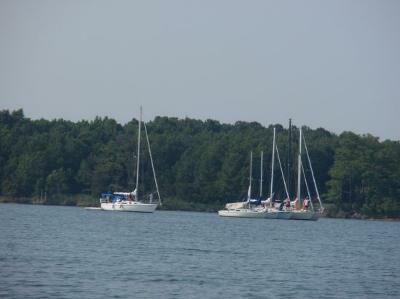 (We had anchored in this creek once before on one of our fleet’s Moonlight Cruises). One of the reasons we wanted to go to the West River to anchor this night was to see fireworks. 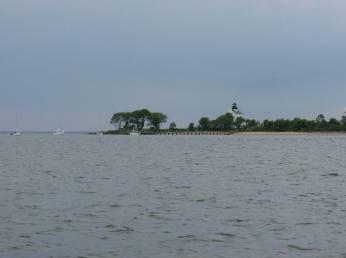 Our anchorage in Claiborne Creek was very protected, near several waterfront houses. The family in the house right in front of our bow put on their own fireworks display, which was very nice for us. On Monday, there was no wind and it got hot again, so we motored the remaining 30 miles home, only stopping for the drawbridge at Kent Narrows. 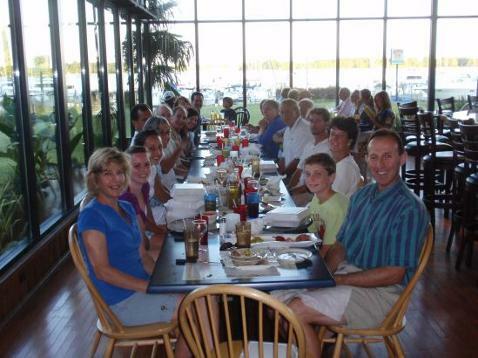 This was our family’s tenth cruise with Fleet 10. We have enjoyed all of them, but this one was special because we had so many new sailors on the cruise. They all said that they would sail with us again. 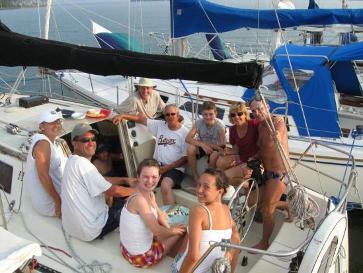 Many of them said that sailing with us was a learning experience. 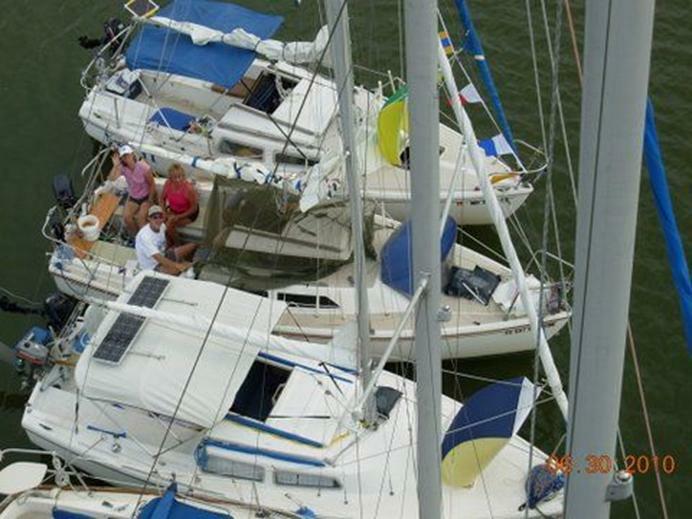 I think that they meant that they learned what a great cruising boat the Catalina 22 can be. 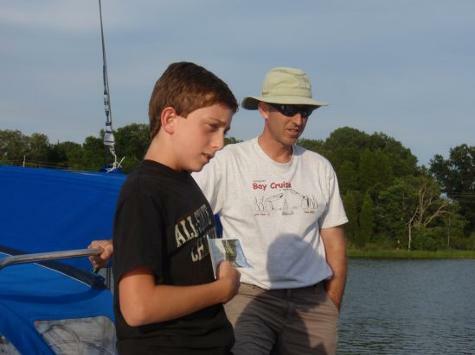 It’s also exciting to see the younger sailors of our fleet enjoying our cruise so much, and we look forward to their involvement on future cruises. 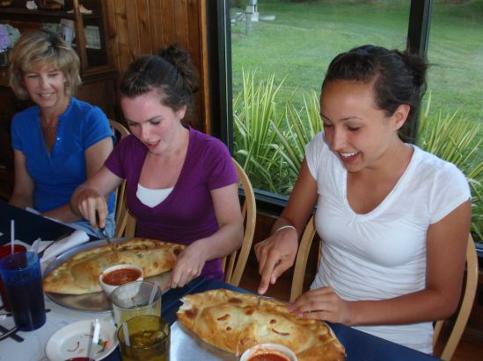 Heather and Carol were such an inspiration to the 15 year olds, Sara and Mary, that the last time we saw them, they were looking for a C-22 for next year’s cruise.